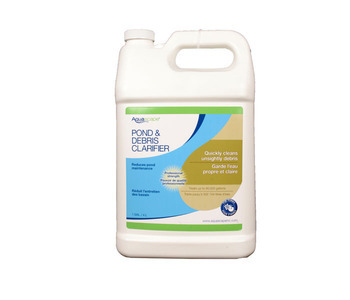 Quickly Cleans Unsightly Debris Aquascape Pond & Debris Clarifier is scientifically blended to quickly restore the water quality. Quickly clears unsightly debris and reduces pond maintenance. Professional Strength. 1 bottle: treats up to 80,000 gal./302,744 liters 1 pump: treats up to 500 gal./1,892 liters Unit Weight: 9.2 lbs.